Entry-level residential controller with extra flexibility, features,and memory. 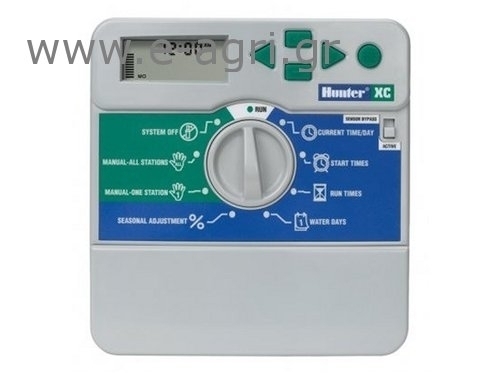 The new Hunter XC presents handy water management control in a compact,user-friendly controller that is capable of meeting the irrigationrequirements for a wide range of residential landscapes. Simply put,the XC brings a whole lot extra to a small controller. Like extrapower…the XC offers a choice of 2-, 4-, 6-, and 8-station models, eachwith plenty of might to operate one or two valves per station plus apump start relay or master valve. Extra features…including globalseasonal adjustment and a 365-day calendar to make water savingseasier, plus a default system that permits retrieval of the originalprogram entered into the controller. Extra flexibility…with threeprograms (each with four start times), multiple scheduling formats, andthe ability to select sensor input by station. And extra memory…with anon-volatile on-board program backup and a high-energy lithium batteryfor timekeeping to assure you’ll never have to reprogram the controllerdue to power outages. The choice for those who demand outstandingreliability, the XC is where to turn for extra peace of mind.